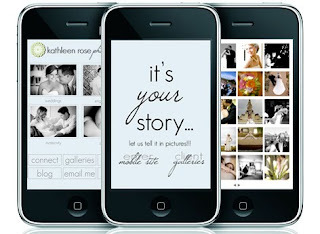 Kathleen Rose Photography Blog: My website has gone mobile!!! Most of the features on my full flash website can be found on my mobile site. There is a link to all of my client galleries, you can email or call me right from the site or check out the latest here on my blog. I also love that I can update this .html version just as easy as I can my flash website. Plus I have complete creative control over how it looks. So go check it out - just type in my usual www.kathleenrosephotography.com on your mobile device and it will automatically redirect you to my mobile site. This is awesome.